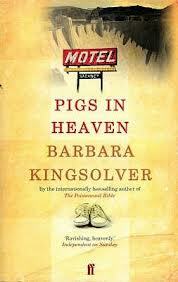 I love Barbara Kingsolver’s books. I know I’m late to the party on this having only discovered her books two years ago but she is an amazing writer. The Poisonwood Bible is one of the best books I have ever read. Pigs in Heaven covers the same terrain as The Poisonwood Bible: motherhood, sisterhood, female friendships, family and surviving. Pigs in Heaven is the story of Taylor and her adopted daughter Turtle who is Cherokee. The central plot is who Turtle really belongs too: the woman who illegally adopted her but who nurtured her through the trauma of her extensive physical and sexual abuse or the Cherokee nation into whom she was born. Kingsolver asks complicated questions about family and sisterhood and, whilst the ending is too pat, it is, fundamentally, a testament to how we should be raising our children: not as possessions but as members of extended communities built on love and tradition. Alice realises something important about her daughter at this moment: that she’s genuinely a mother. She has changed in this way that motherhood changes you, so that you forget you every had time for small things like despising the color pink. Sympathizing over the behavior of men is the baking soda of women’s friendships, it seems, the thing that makes them bubble and rise.